Apparently, the two charismatic artists ran into each other in the Hongdae district over the Chuseok holiday. Prepix, the choreographer to B2ST (love his work!) 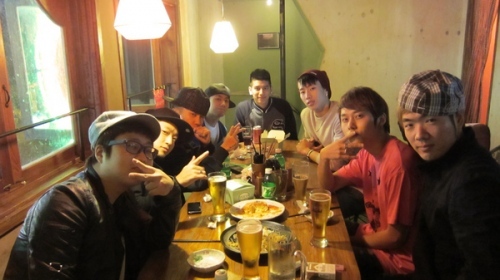 recently posted a photo of the ‘strange combo’ of people including him, B2ST’s Jun-hyung, and Jay Park and his AOM crew, as well as a few others at what looks like a restaurant getting their Chuseok grub on. I wonder if this really was just a ‘chance’ encounter or if there is some sort of collaboration in the works…hmmmm…. Jay + Jun-hyung and some tight choreo would be hot! I’d like the see that. Also, just for clarification, is it Beast or BEAST or is B2ST still ok?!! !